Along with EQ and compression, reverb is an indespensible tools in any producer’s arsenal – whether it’s for helping a mix sound more cohesive or creating some more left field sounds. 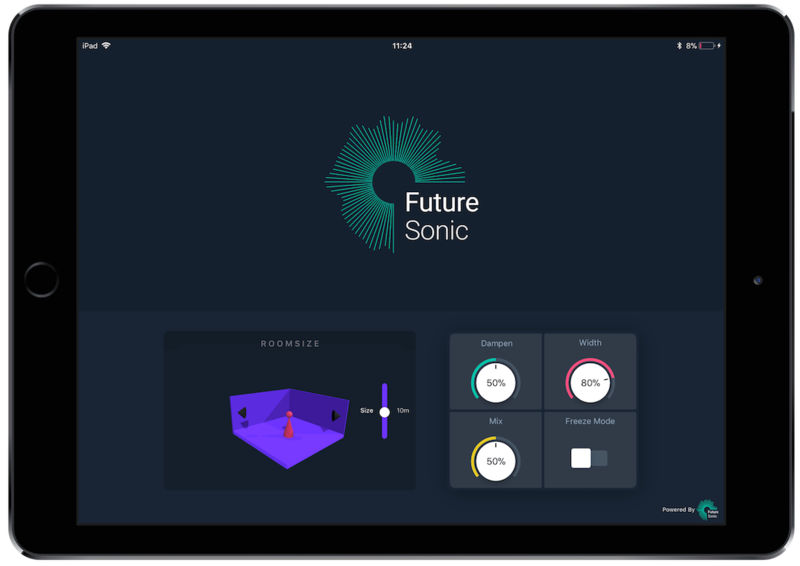 So we’re thrilled to announce the release of our very own reverb app for iOS: FS FreezeVerb. Available for download on the App Store from January 16th, the FS FreezeVerb can be either used as an Audio Unit inside any AUv3 host on iOS, or alternatively it can be run as a standalone application. FS FreezeVerb is a lush sounding iOS reverb app, perfect for both subtle ambience and cavernous reverberation. With its clear and simple design, FS FreezeVerb makes it easy for users to dial in their ideal reverb settings, complete with visualisation of the virtual room that changes size as the Room Size parameter is altered. The app’s Dampen function lets users vary the damping within their virtual room – lower settings mean less damping, making the room’s walls more reflective. As the Dampen value increases, the tonal characteristic of the reverb changes resulting in a darker reverb sound with less high frequency content. The Width control alters the stereo width of the reverb – the higher the Width setting, the wider the sound. FreezeVerb also features a dry/wet mix control letting users vary the level of the reverb. But the real defining feature of FS FreezeVerb is its unique Freeze function. When turned on, the reverb signal at that particular moment is ‘frozen’ and continues indefinitely instead of decaying like it normally would. This function offers a range of creative opportunities for users, making it easy to create droning textures and ambient soundscapes. When the Freeze function is then turned off again the reverb signal decays as normal. FS FreezeVerb is compatible with both iPad and iPhone and will be available on the App Store from January 16th priced at £3.99. FS FreezeVerb is also available as part of our Time and Space Bundle which also features FS Reverser Delay and FS Refraktor.